This meeting took in Paris, from Friday March 18 to Sunday March 20, 2011. It was mostly dedicated to planning deep changes for Eigen 3.1: the expression evaluator. 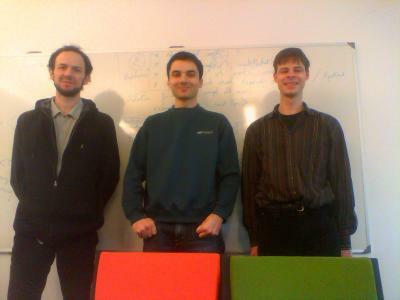 Gael, Thomas and Benoit started working on the expression evaluator. A work plan was outlined on the whiteboard. A repository was created for implementing simple cases, while Gael worked on the tricky case of matrix products. Jitse had arrived, Thomas had left. So Gael, Jitse and Benoit continued what had been started, and realized that a big change of approach was needed. Indeed, the proof-of-concept code tried thus far suffered from the very same lifetime-of-temporaries issue that we wanted to solve. The fix was quickly implemented. Other issues were brought to the whiteboard: for example, how much of the expressions code needed to be deferred to the evaluators? Joel joined us. Gael kicked the day off by showing us the wiki page he wrote to summarize all our ideas and decisions. Joel shared many insights from his experience in the NT2 project, especially about expression evaluators but also general tricks about getting better compilation times, and much more. In return, we shared experience about various aspects of Eigen, like handling triangular/diagonal/special matrices and views, and CMake tricks. Jitse also continued working on implementing the expression evaluators for various expressions. We were at INRIA like last year, 23 Avenue d'Italie in the 13th arrondissement. On Friday we were in the same room as last year, while on Saturday and Sunday we were two floors below, at IRILL. This page was last modified on 21 March 2011, at 10:20. This page has been accessed 23,598 times.